In my last post, I discussed the earliest Christian scientists (complements of Nancy Pearcey and Charles Thaxton) and used them to make the case for evidentialism. These Christian scientists conducted science to demonstrate the existence of an Intelligent Creator. While I stated in the last post that Reformed Epistemologists like to argue that faith came before science with these Christian scientists, that is irrelevant to the discussion; what matters in the discussion is that these Christians used their faith to launch out into the physical world. In the physical elements, they desired to find the Lord of the physical elements, the One in whom they believed. Contra the position of Reformed Epistemology (RE) today, these men did not sit on the sidelines and say, “I can choose to believe in God without evidence or argument...nor do I need to find such evidence or arguments.” Instead, they ventured out into the physical world to discover the presence of the God they trusted in. Not only did they study science to discover the work of their God, they also did this to reach the religious skeptics of their time. Newton, as Pearcey and Thaxton write, desired to use his scientific discoveries in an apologetic manner. And I will be bold enough to say that if these Christian scientists lived in a world of religious skepticism, how much more of a religiously-skeptical world do we live in today...and how much more we need evidences and arguments!!! This post will deal with an issue that I have with Reformed Epistemology (RE), an issue that has fueled the posts that I’ve already written on the series and that will fuel the remainder of the series. My biggest problem with Reformed Epistemology, apart from the faith that it is Calvinist in its theological affinity, is that RE does not pay proper respect to unbelievers as persons made in the image and likeness of God. Before I get into my critique, let’s look at the so-called “Freud & Marx Complaint” of Dr. Plantinga’s. What is the so-called “Freud & Marx Complaint”? The F&M complaint pertains to the statements made by Sigmund Freud and Karl Marx with regard to whether or not Christians are rational beings. Freud and Marx both agree that Christians are not rational in believing in God. To see this, let’s hear from both Freud and Marx. “These [religious beliefs], which are given out as teachings, are not precipitates of experience or end-results of thinking: they are illusions, fulfillments of the oldest, strongest, and most urgent wishes of mankind. The secret of their strength lies in the strength of those wishes. As we already know, the terrifying impressions of helplessness in childhood aroused the need for protection---for protection through love---which was provided by the father; and the recognition that this helplessness lasts throughout life made it necessary to cling to the existence of a father, but this time a more powerful one. Thus the benevolent rule of a divine Providence allays our fear of the dangers of life; the establishment of a moral world-order ensures the fulfillment of the demands of justice, which have so often remain unfulfilled in human civilization; and the prolongation of earthly existence in a future life provides the local and temporal framework in which these wish-fulfillments shall take place” (Sigmund Freud, quoted by Alvin Plantinga, Warranted Christian Belief. New York and Oxford: Oxford University Press, 2000, pages 138-139). What Freud says here is that Christians have “created” the idea of a heavenly Father due to “wish-fulfillment.” In addition, we have created the idea of morals due to our own sense of justice, and “the prolongation of earthly existence” (ie., eternal life) in order to provide a place for our greatest wishes to be fulfilled. In short, religious belief is “illusion.” Man is simply irrational to have religious beliefs of any kind. “Religious distress is at the same time the expression of real distress and the protest against real distress. Religion is the sigh of the oppressed creature, the heart of a heartless world, just as it is the spirit of a spiritless situation. It is the opium of the people. The abolition of religion as the illusory happiness of the people is required for their real happiness. The demand to give up the illusions about its condition is the demand to give up a condition which requires illusions. The criticism of religion is therefore in embryo the criticism of the vale of woe, the halo of which is religion” (Karl Marx, quoted by Alvin Plantinga, Warranted Christian Belief. New York and Oxford: Oxford University Press, 2000, page 141). Religion, Karl Marx says, is “the opium of the people.” What role does “opium” play? It is a drug, used for the purpose of escaping reality. This is what religion is to civilization, Marx says. It is humanity’s way of “drugging” itself to escape from the cruelty of reality. In the same way that it is tragic to drug oneself out of reality, it is also tragic to use religion for this purpose, Marx would say. “And here we can see an initial difference between Freud and Marx: Freud doesn’t necessarily think religious belief is produced by cognitive faculties that are malfunctioning. Religious belief---specifically belief in God---is, indeed, produced by wish-fulfillment; it is the product of illusion; still, illusion and wish-fulfillment have their functions. In this case, their function is to enable us to get along in the cold and heartless world into which we find ourselves thrown...beliefs produced by wish-fulfillment aren’t oriented toward reality; their function is not to produce true belief, but belief with some other property (psychological comfort, for example). So we could initially put it like this: religious belief is produced by cognitive processes whose function is not that of producing true beliefs, but rather that of producing beliefs conducive to psychological well-being” (Plantinga, WCB, page 142). We’ve just examined Freud and Marx and their views of religious belief. And this last quote shows us what someone like Freud believes about those who have theistic belief. Someone who believes in God does so out of wish-fulfillment, and is not aiming to believe what lies in reality, but rather, what lies within the deepest longings of the human soul. If a belief is not aimed at reality, Freud would say, it is only aimed at the personal desires of the individual. Because religious belief (theistic) is not aimed at reality, it is not aimed at “objective” truth...but rather, “subjective” longing. “We could put the same point by saying that some withholdings are rational and some irrational. An important sense of the term ‘rational’ is one in which a belief is rational if it is produced by cognitive faculties functioning properly. But the same can be said for withholdings: they can be produced by cognitive faculties functioning properly...but also by cognitive faculties functioning improperly...According to the model, the same thing can happen with respect to belief in God. Failure to believe can be due to a sort of blindness or deafness, to improper function of the sensus divinitatis. On the present model [Aquinas/Calvin model], such failure to believe is irrational, and such withholdings lack the analogue of warrant. 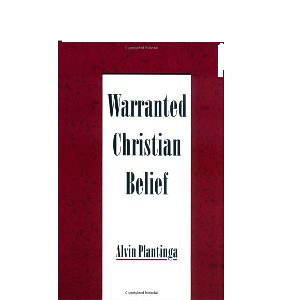 It doesn’t follow that failure to believe is unjustified...but it is nonetheless irrational...in some contexts it [withholding, failure to believe, agnosticism] is a sign of serious irrationality” (Plantinga, WCB, pages 185-186). “...according to the model, it is really the unbeliever who displays epistemic malfunction; failing to believe in God is a result of some kind of dysfunction of the sensus divinitatis” (Plantinga, WCB, page 184). Some may ask the question, “What’s so heinous about this?” Think back to the Freud and Marx responses. Religious belief, according to Freud, is an “illusion”; for Marx, it is “the opium of the people,” nothing more than an escapist drug. But how does Dr. Plantinga respond on this model? He turns around and labels unbelievers “irrational.” How is the unbeliever engaged when, in response to their labeling us “irrational,” we turn around and label them “irrational”? I don’t think this solves the problem at all. In addition, unfortunately, to label the unbeliever “irrational” is to disrespect the unbelievers’ possession of the image of God. In Genesis 1:26, did God not say, “Let us make man in our image, after our likeness”? Did this desire to create man with the imago dei include the unbeliever? It did. God did not distinguish between making those who would believe in the image of God and those who do not believe without the image. Both those who would believe and those who would not were made with the image. By possessing the image, both believer and unbeliever possess rationality and are able to think intellectually and act responsibly in the world.